Here's another Ashland, Oregon fountain for you. What a great town-- such an abundance of good water! There are two of these fountains on different corners of Main Street, which is the best possible siting for a drinking fountain: high pedestrian traffic areas. And let me tell you, this is one of my all-time favorite drinking fountains. The fountains are operated by a pedal, which solves the age-old problem, for many women, of needing two free hands to use a drinking fountain-- one to push the button and one to hold back your hair. 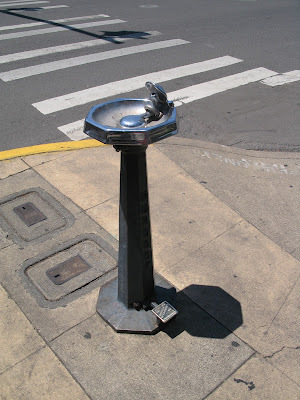 Sadly, these drinking fountains can no longer be installed anywhere, as they aren't wheelchair accessible. (We definitely advocate accessibility for all! 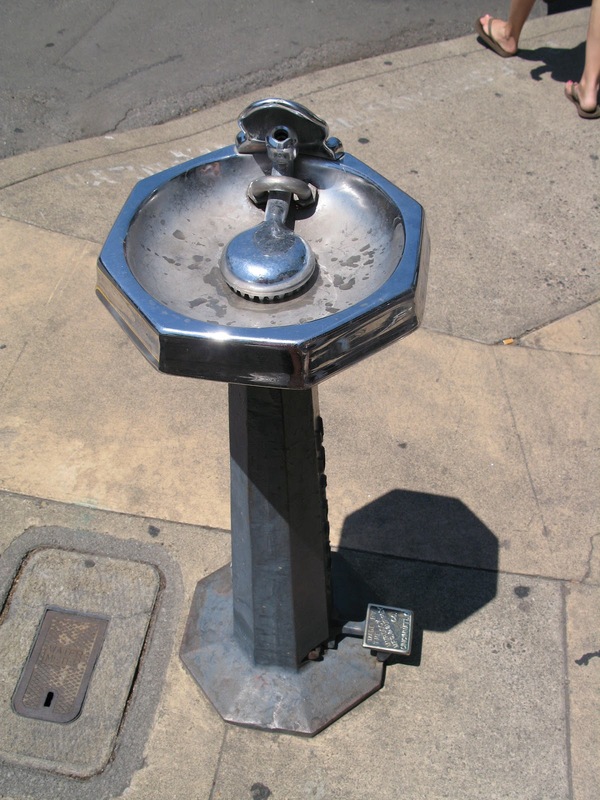 But it's sad that we'll never get any more of this gorgeous drinking fountain.) These fountains have a few seconds of lag time between stepping on the pedal and getting water, but those seconds are full of delightful anticipation, as you hear the water start to gurgle up the pipes. And then! The stream of cold, pure water that emerges is fat and succulent! It comes out in a perfect arc, and with twice as much water as you normally get from a drinking fountain. I've seen this drinking fountain model installed in several other places, including the Philadelphia Zoo. I love it so much. It's just a simple, elegant, and functional design. I wish I had one in my living room.